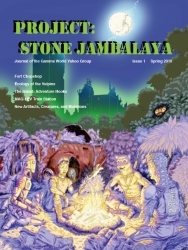 Project: Stone Jambalaya is an eZine dedicated to the GAMMA WORLD® roleplaying game. 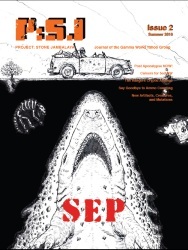 It supports all editions of the GAMMA WORLD® roleplaying game. Northerntroll gathered some mutants together, tossed a stone in the cauldron, and bang...every contribution added up to a wonderful dish. Here is the editor's intro from the inaugural issue. THE FIRST STONE Welcome to our inaugural issue! There’s an old saying about a picture and a thousand words. Fortunately for me - and you, Josh’s beautiful cover says just about everything I could hope to about our project. What was originally just a passing thought about a regular potluck day, has become just a little bit more. In the best tradition of our hobby, the group came together, with everyone bringing their part, sharing their talents and ideas and energies, to create what you now see. Thank you to everyone who contributed to this project, and to all those who came before us - creating the work we build upon.